Delta Zeta was founded on October 24,1902, at Miami University in Oxford, Ohio, the same year the university first allowed women students. Its colors are rose and green and its flower is the Pink Killarney rose. 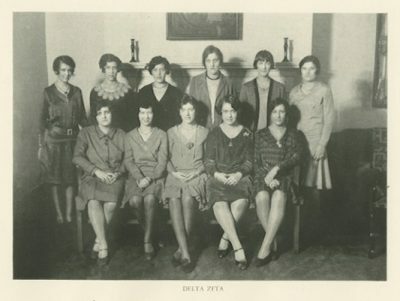 The Beta Epsilon chapter of Delta Zeta was founded at Penn in 1928 and was active until 1932.